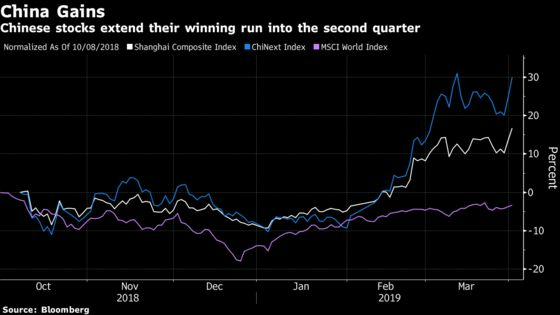 (Bloomberg) -- Shanghai’s equity benchmark closed at the highest since May and the Hang Seng Index entered a bull market, as data suggested the Chinese economy is improving. Yields on 10-year government bonds jumped the most since 2017. The Shanghai Composite Index rose 2.6 percent and out of the 3,000-3,100 range it has been largely stuck in for a month. Small caps also continued their strong run, with the ChiNext gauge jumping 4 percent, building on its world-beating 35-percent rally in the first quarter and erasing all of its loss from last year. The yield on sovereign debt due in a decade rose 8 basis points to 3.15 percent. China’s manufacturing purchasing managers index rose to 50.5 in March, the biggest increase since 2012 and beating economists’ estimates, according to data released Sunday. The mood was bolstered Monday morning as the Caixin manufacturing index also signaled expansion. After a rout in 2018, Chinese equities are rebounding strongly this year and outrunning other markets as the government pledges to support growth and trade talks with the U.S. show signs of progress. China’s Vice Premier Liu He is due for talks in Washington following another round of negotiations in Beijing last week. China Announces Trade Concessions as Liu He Heads to U.S. The yuan was little changed at 6.7131 per dollar following its 0.4 percent advance on Friday, its biggest gain in a month. The yuan is one of the strongest currencies in Asia this year, rising 2.5 percent, just behind the Thai baht’s 2.6 percent rally. In Hong Kong, the Hang Seng Index rose 1.8 percent, the most since Jan. 15, taking its advance from an Oct. 30 low to 20 percent. “China acted much earlier than policymakers in other major economies to announce stimulus policies and we’re starting to see some initial results now with March PMI returning to expansionary territory,” said Linus Yip, a strategist with First Shanghai Securities Ltd.